F&B joints around town are creating their own burgers, cocktails and even tacos to commemorate the upcoming Trump-Kim summit. 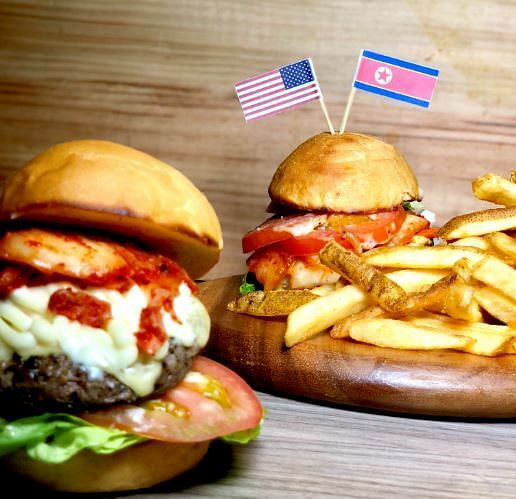 SINGAPORE - As anticipation for the historic summit on June 12 between United States President Donald Trump and North Korean leader Kim Jong Un in Singapore grows, food and beverage outlets are gearing up to mark the event by rolling out themed food and drink with both American and Korean influences. Here are places to check out in Singapore to whet your appetite. New nasi lemak brand Harmony Nasi Lemak has set up shop in OSG Bar + Kitchen offering nasi lemak with a twist. It combines dry-aged beef from the United States, with kimchi, basmati rice, and sambal with ikan bilis. The dish is intentionally served in a bowl, and with chopsticks - a symbol of Asian culture, to mark the US and North Korea coming together in Singapore. The dish is priced at $21 nett. 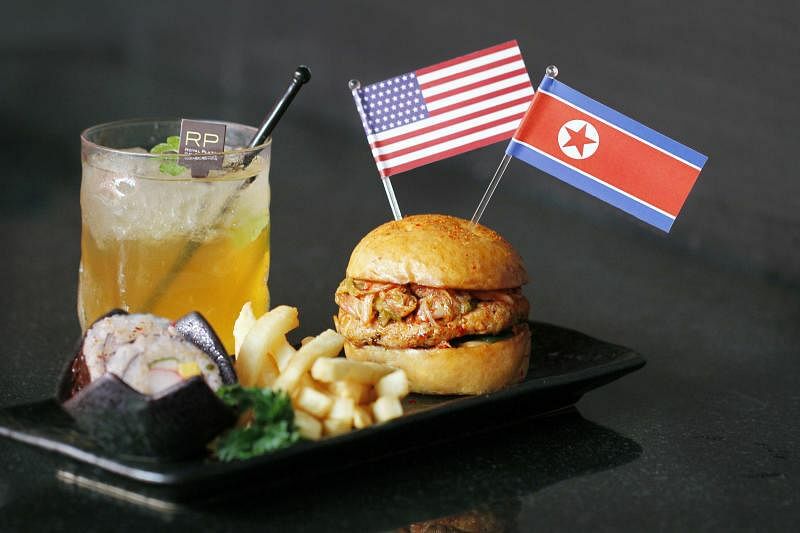 Royal Plaza on Scotts hotel offers a menu combining American and Korean influences in honour of the historic event. The grilled Trump-Kim Burger is made up of a minced chicken, seaweed and kimchi patty, served with Korean rice rolls and fries. The Summit Iced Tea is specially concocted by infusing Korean honey yuzu into traditional iced tea - which is said to have originated in America. The burger is priced at $12, and the drink at $6 to mark the date of the summit. 3. "THE BURGER FOR WORLD PEACE"
Gourmet burger restaurant Wolf Burgers has introduced a "Burger for World Peace", which is a riff on the American Philly cheeseteak with Korean influences. The burger comprises bulgolgi marinated shabu brisket, kimchi mayo, Korean-style pickled radish as well as caramelised onions and American sharp cheddar. The restaurant said it hopes the special limited edition burger will help "the two super powers to #settlethebeef". It also sent out invitation letters to Mr Trump and Mr Kim to sample the burger. In the letter to Mr Trump, the restaurant writes: "We would like to cordially invite you and Chairman Kim to our outlets to enjoy this burger that we have created in honour of both your efforts to come together for this historical summit." It also added in the letter that it would be "delighted" to deliver the burgers to both leaders if they wish. Fancy a Rocket Man Taco or an El Trumpo Taco? Mexican restaurant and bar Lucha Loco has come up with a "Loco Taco Summit" with its two seasonal tacos. The Rocket Man Taco, representing Mr Kim, features Korean fried chicken, spicy dressing, pickled white radish and sesame. Meanwhile, the El Trumpo Taco comprises a beef patty, melted cheese, lettuce, chipotle ketchup, secret sauce and pickles. Diners who purchase the tacos, priced at $10++ each, can enter a draw to smash custom-made Trump-Kim pinatas. Gastropub Escobar, named after Colombian drug kingpin Pablo Escobar, has launched two cocktails in line with the summit. 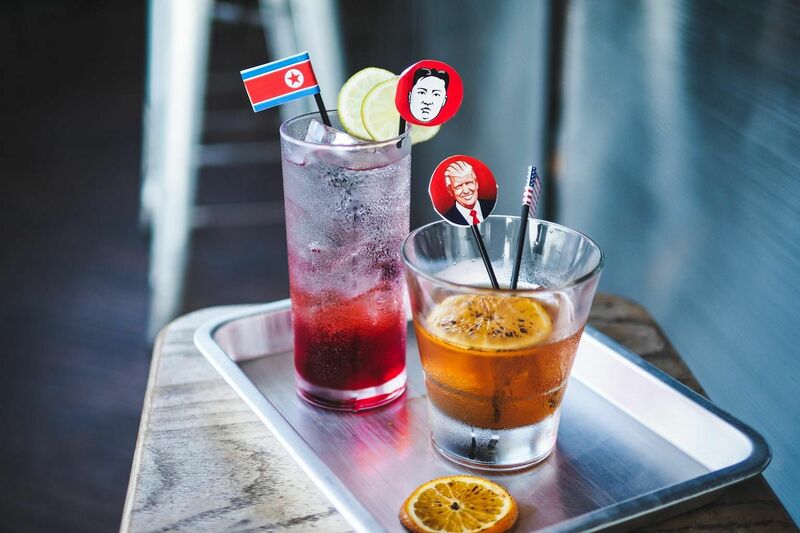 The "Trump" is a blue, bourbon-based cocktail while the "Kim" is a red cocktail with soju. They each cost $12.60, a nod to the summit's date. There is also a drinking "US-North Korea showdown". 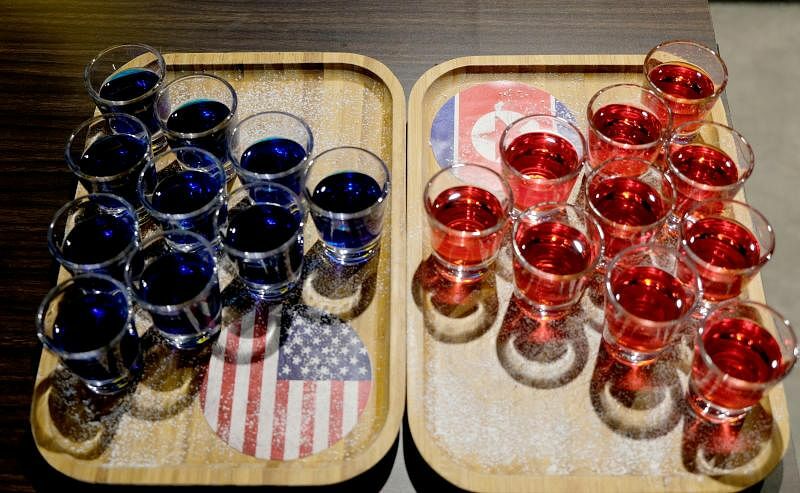 Order a tray of 20 shots for $60 - 10 vodka shots on the blue side (for the US), and 10 soju shots on the red side (for North Korea) - and play scissors-paper-stone. The loser drinks a shot. Delegates and foreign journalists who will land in Singapore for the summit will also enjoy discounts at the bar, including one drink on the house and a 30 per cent discount for any order of bar snacks or meal. To commemorate the summit, Empire Sky Lounge is adding several limited edition cocktails to its menu. 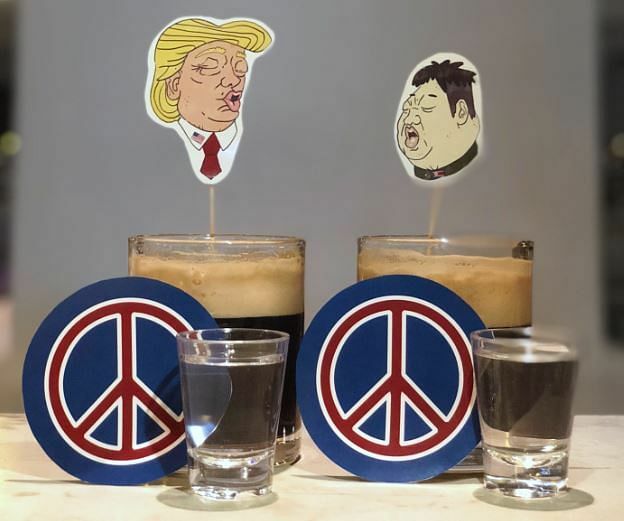 Specially crafted shots dubbed World Peace Bombs will be priced at $3++ each, while cocktails such as the Whisky Trump and The Rocket will also be available at $12++ each. The Whisky Trump is a whisky-based cocktail "with an orange tang", while The Rocket is a Campari-based red cocktail. The lounge will also add seasonal food items to its menu, including The Peace Platter of kimchi chicken wings, mini burger and fries. This burger from The Butcher's Kitchen fuses American and Korean cuisine influences. It features a US Black Angus beef patty as well as fresh kimchi, onions, tomatoes and romaine lettuce on a homemade bun. 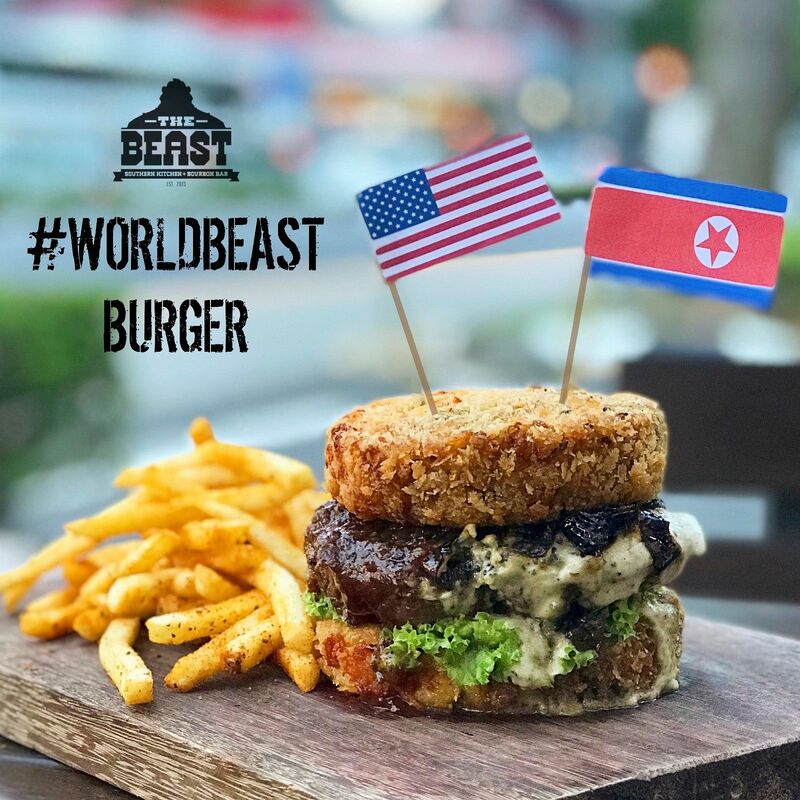 Red, white and blue - the colours of both North Korea and the United States' flags - are featured in this burger by Sinfonia Ristorante. The dish features red meat - Japanese Wagyu beef steak topped with caviar; white meat - a deep-fried chicken slider with aioli sauce and sweet chilli sauce; as well as a blue cheese sauce. The special creation is priced at $42++. This cocktail drink, made up of diet Coke, tequila, Asahi Black and white grape soju, was concocted by Hopheads Bar. The drink, called The Bromance, is served in a pair because "it takes two to make a bromance". It costs $19++. Customers who purchase the drink will be able to take home the summit-themed stickers of Mr Trump, Mr Kim and a world peace sign. The #worldbeast burger from The Beast is a half and half creation. The American half comprises a beef patty, bacon jam and BBQ sauce sandwiched between oozy fried mac and cheese 'buns' while the Korean half offers a bulgogi beef patty, caramelised onions and creamy garlic sauce in deep-fried kimchi rice 'buns'. The burger costs $23.